China Desk: During the 9/21 Earthquake of 1999, Taiwan independence propagandists disseminated a Big Lie. They alleged that Russian rescue workers were forced to detour around mainland Chinese airspace, delaying their arrival on Taiwan, possibly costing human lives. This allegation was a flagrant lie. Below is a letter from Julian Clegg to the Taipei Times refuting this urban legend, which stubbornly persists even though it was discredited a decade ago. The Moscow correspondent for the China Times who refuted this urban legend, was Arkady Borisov. His name in Chinese is 包理述 (Bao Lishu). The Chief Coordinator of the Russian Emergency Assistance Team (Emercom) when the 9/21 Earthquake struck, was Vladimir Boreiko. His name is also Latinised as Boreyko and is given in the China Times article as 博雷科 (Boleike). Monday marks the 10th anniversary of the 921 Earthquake of 1999. Members of rescue teams who came to Taiwan’s aid after the quake have been invited to attend a series of commemorative events this week. I must point out that this accusation, though widely believed by people in Taiwan, is untrue. When the accusation first appeared in the media, I felt doubtful for three reasons. First, different media disagreed widely about the length of the delay. Second, according to my understanding of relations between Russia, [mainland] China and Taiwan, I thought it unlikely that [mainland] China would refuse such a request. Third, the source of the report was said to be a Russian-language newspaper Segodnya (Today). I found this odd because it is very rare for Taiwanese media to report stories from the Russian media, especially when the original article is in Russian. Out of curiosity, I visited the Russian trade office on Xinyi Road to ask whether the reports were true. The Russian trade representative and other staff said they had not heard of it. He explained that he had played a key role in facilitating the rescue mission. He assured me that the Russian team had never requested to fly through [mainland] Chinese air space, since the quickest and most efficient way for them to come here was to follow their established domestic route from Moscow to the Russian Far East, and from there across the sea to Taiwan. The trade representative said [mainland] China could not have refused permission for the Russian plane to fly over [mainland] China, because the Russians never made any such request. Following those reports in 1999, however, Taiwanese politicians, including then foreign minister Jason Hu (胡志強) and then Taoyuan County commissioner Annette Lu (呂秀蓮), publicly condemned [mainland] China for its supposed callousness in delaying the Russian rescue mission,. The incident was cited as a pretext for refusing material aid, such as tents, prefabricated houses and so on, from [mainland] China, and turning down Beijing’s offer to send a medical team, although a cash donation from [mainland] China was accepted. Incidentally, Taiwan also refused aid offered by the Philippines. After leaving the Russian trade office, I told what I had heard to Time magazine’s Taiwan correspondent Donald Shapiro, and called in to Li Ao’s (李敖) television call-in program and another call-in program on radio. On Oct. 1, 1999, Taiwan’s representative office in Moscow invited members of the rescue team, who had just returned to Russia, to dinner. Arkady Borisov, Moscow correspondent of the China Times, asked the rescue team whether it was true that they had been refused passage through [mainland] Chinese airspace. Team leader Vladimir Boreiko replied that it was not true, and proceeded to give the same account that the Russian representative in Taipei gave to me. This report appeared in the China Times on Oct. 3, 1999, and is still available online. These are the facts of the matter as far as I know. 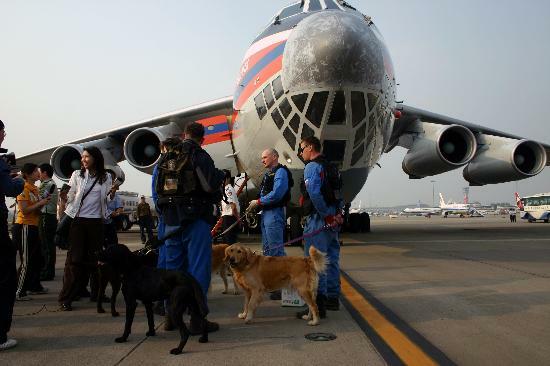 Anyone who is still in doubt will have a chance to ask the Russian rescue team members during their visit to Taiwan this week. China Desk: below is the China Times article mentioned in Julian Clegg’s letter. This China Times article, submitted by Russian reporter Arkady Borisov, refuted this Taiwan independence Big Lie back in 1999, less than two weeks after the quake struck. Thank you for posting my letter, Bevin. I hope it will set the record straight at last. For those who can read Chinese, the China Times report of 3 October 1999 is archived here: http://forums.chinatimes.com.tw/report/921_quake/88100334.htmReporter Arkady Borisov's Chinese name is 包理述 (Bao Lishu). Vladimir Boreiko's name may also be Latinised as Boreyko and is given in the China Times article as 博雷科 (Boleike). He is the former Chief Coordinator of the Russian Emergency Assistance Team (Emercom). Dear Julian,Not at all. Thank you for taking the initiative to set matters straight. It is simply astounding how resilient some lies can be. They are like cockroaches. Try as one might, one just can't flush them down the toilet.